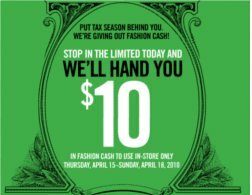 Head to The Limited today, April 15th, and get $10 off your next purchase good through 4/18! Minimum purchase must be equal to or greater than $10. Limit one per customer. Cannot be combined with Virtual Dollars, other coupons or redeemed for cash. Not valid on markdown prices, previous purchases, purchase of gift cards, or as payment on The Limited Card.